Andy's Forum > Categories > ALTERNATIVE HEALTH > Medical microchips to be implanted in humans by 2017. Will they be mandatory? 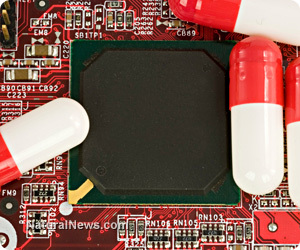 The future of prescription drugging and birth control lies in a microchip. Right now, chips with drug reservoirs can be implanted directly under the skin, delivering doses of pharmaceuticals or birth control hormones at the same time each day. The implanted chip is designed to be remote-controlled and governed by "medical professionals." Essentially, chipped individuals won't be able to wean themselves off of side-effect-ridden drugs. The chip can be programmed to release drugs, day after day, year after year, at a "professional's" directive. The micro-reservoir technology, first developed at the Massachusetts Institute of Technology in the 1990s, involves an implantable chip designed to release drugs into the body by a wireless signal. This technology, first pioneered by Robert Langer, Michael Cima, and John Santini, now powers a new company called microChip. On their site, the company states that they are ready to safely incorporate "long-term implantable drug delivery technologies with wireless communications." Their first microchip experiment is projected to hit the medical field in 2017 and will offer contraceptive services. The new chip is to be implanted just under the skin by local anesthesia. Once inside, the reservoirs can begin delivering hormones progestin and estrogen as a birth control method. According to Obamacare, businesses are required by law to offer contraceptive services like this chip. Theoretically, the American people have been ordered to chip one another, through a required tax that is used to invest in controlling everyone's fertility and liberty. A clinical trial was conducted in 2012 for an osteoporosis treatment initiated by the new microchip technology. The chip delivered parathyroid hormone 1-34 (PTH), an anabolic agent also known as teriparatide, directly into the blood of volunteers with osteoporosis. The chip was implanted directly under the skin of the patients' waist line and delivered a controlled dose of PTH for four months. Medically, the chip was deemed safe, as its implementation advances forward. According to the company microChip, the first installments may realistically deliver drugs for up to five years, allowing users to take their prescriptions hands-free without daily injections or pill popping. The company believes that they can even make a chip that delivers a consistent dose for up to 16 years! The company reports that the device could even transmit data back to hospitals, so doctors "could have permanent records of exactly what you took when." CEO Bradley Paddock believes, "The MicroCHIPS implantable drug delivery device is the greatest advancement in delivering medicine since the first tablet pill was developed in 1876." How might the concept of being chipped destroy personal sovereignty, as a system of sick care is branded inside the skin? How might individual liberty be demolished as "health care professionals" govern one's dosage through wireless communications? How might this technology be disrupted, misused or hacked, potentially delivering obscene amounts of drugs into user's systems? How might this technology ultimately be a form of greater population control through its aggressive birth control mechanisms? How might this technology open the door for drug companies to gain an even tighter grip over the lives of people who struggle with horrendous side effects, drug-to-drug interactions, and drug-to-heavy-metal-catalyst implications? Lance Johnson is a passionate learner, researcher, writer, and entre-health-leader. He and his wife have launched an all natural products movement from the ground up at http://www.allnaturalfreespirit.com. The Johnson's are inspired by natural healing and the lifestyle changes that have awoken their spirit and given them quality of life.